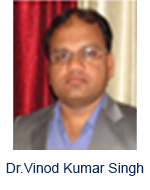 Dr.Vinod Kumar Singh is an Associate Professor/Head of Department in the Electrical Engineering Department of S. R. Group of Institutions at the University of U.P.T.U. Lucknow. He received his Ph.D. Degree in Electronics & Communication Engineering from B.U. Rajasthan University in 2013 then worked as Lecturer in I.E.T.Bundelkhand University as well as in S. R. I. Datia. 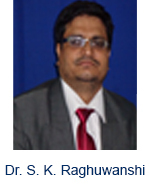 Also He worked as an Associate Professor/Head in S. R. Group of Institutions, Jhansi for four Years. He is having about 12 Years of Experience in the field of Electrical/Electronics Engineering. His Area of Expertise includes: Dual and Tripple band Microstrip Antenna, Ultra wide band and Textile Antenna. He is the author of Book Chapter in Springer. Dr. Sanjeev Kumar Raghuwanshi received a bachelor’s degree in electronics and communication engineering from Shri G.S.Institute of Technology and Science Indore, Madhaya Pradesh, India in 1999 and a master’s degree (M. Tech) in Solid State Technology from I. I. T. Kharagpur, India in 2002. He received a Ph. D. degree in the field of Optical Fiber Communication & Electronics Communication Engineering from the Department of Electrical Communication Engineering of I.I.Sc. Bangalore, India, in 2009. In 2010 he joined as assistant professor at Electronics Engineering Department of Indian School of Mines, Dhanbad. He is working in the area of photonics. Current research interests include Optical Fiber Communication, Optical Modulators and MEMS. He has also authored a book titled Contemporary Optical Fiber Technology published by Agrawal Publication, Agra, India, in 2011. He has also contributed one chapter in Optical Network: Current Issue and Review published by IGI Global, USA. He has implemented one project on modeling of wavelength-division multiplexing optical components finance by Indian School of Mines, Dhanbad. He has published over 40 research papers in reputed national and international journals and presented about 45 research papers in different national and international conferences, including IEEE. He is a member of IEEE. Currently, he is guiding Six Ph. D. students. His research group have three regular research scholar working in field of optical devices, optical fiber communication and MEMS.